You’ve found the perfect job, and the greatest benefit is that you are allowed to work from home. The first day is the most productive because you are busy getting acclimated to your newfound freedom and escaping the daily dregs of the office. Even during the first week, you are busy learning your new job and you remain productive and engaged. But as the weeks pass, you start to feel like productivity is slipping. You find it hard to focus, and suddenly, it seems like your work hours take you late into the night. So what do you do? Give up the home office and trudge into the office every day to reclaim your productivity? I say you don’t have to, you just need to make yourself more effective when you are working remotely and establish boundaries so that work does not conflict with personal life (or visa-versa). First, remind yourself of the benefits of working from home. You are free to set your own schedule. You don’t have to wake up early and there is no one looking over your shoulder. This alone can really reduce your stress level. And it makes sense economically, too. You probably save money on gas by not driving to work every day and ordering expensive take out. Plus, there might be a tax savings by claiming a home office when you file. Once you’ve reminded yourself of the benefits, it’s time to tackle the challenges that arise when you are not part of the cubical environment. It can be really hard to get your day started with no scheduled work time and it can be difficult to stay focused when there are distractions like home chores, children, a spouse, or any of the other things that you’d rather be doing instead of working. Plus, the lack of social interaction can make you feel like you are detached from projects in the pipeline. And when your office is at home, it can be very hard to turn it off and walk away. These challenges are not insurmountable, and by following a few guidelines, you can mitigate them in order to reap the benefits of working from home. Maintain a presence at the office. It’s important to keep a presence in the office. Even Monster.com® and others suggest this approach. Contact your office, boss, and co-workers often to keep them apprised of your progress. This will also present an opportunity to get briefed on what is happening down the road. Your feelings of alienation will dissipate while giving you a clear view of expectations so you can focus your time and be productive. On the flip side, your employer will have peace of mind knowing you are engaged and in touch on a regular basis. Experts say it’s important to create a work zone in your home and it is sound advice. If you’re on the couch in plain view of the kids, dog, cat, or laundry, how could you focus on work? If you don’t have a designated work space, you also run the risk of crossing boundaries in your home. Suddenly the areas where you used to relax remind you of work, and you find difficulty getting out of work mode. The solution is easy, just designate an area in your home with a proper work desk and chair that provides some relative peace and quiet and minimizes distractions. Ideally, it’s a good idea to make sure the area is used only for work. And when you shut down and leave the space, tune out work too, just as you would when you’ve punched out for the day from the office. It’s an easy trap to fall into-suddenly you are working past your normal workday and find it hard to turn away from the computer.. 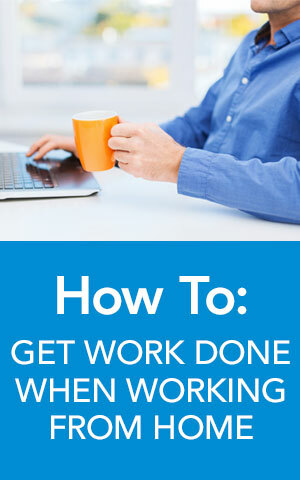 It seems like you can’t seem to stop working, and your family, friends, and pets notice. Establishing a defined schedule can keep you from putting in too many hours and at the same time, it will keep you and those you love sane. Start working at a set time every day and stick to it. It’s equally important to set a time to stop working and follow through. Knowing when you start and end will help maintain productivity during the hours that you are working. In sum, the benefits of working from home are substantial, but it requires some thought to remain productive and engaged. Follow these basic guidelines so you can reap the benefits and avoid the potential pitfalls.